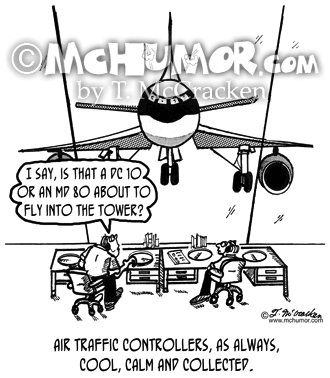 Weather Cartoon 2051: An air traffic controller looking at stripes in the air says, "I thought patchy, not striped fog was predicted for today." 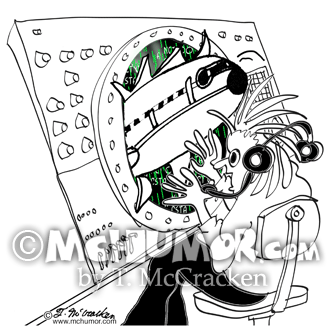 Flying Cartoon 2052: "I say, is that a DC 10 or an MD 80 about to fly into the tower? 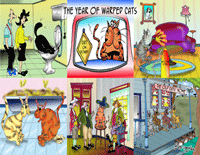 "Weather Cartoon 2051: An air traffic controller looking at stripes in the air says, "I thought patchy, not striped fog was predicted for today." 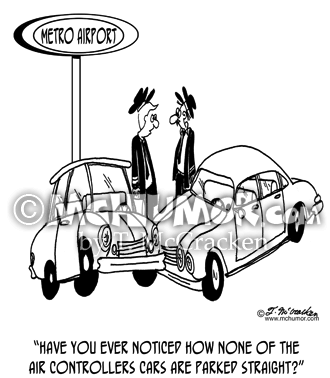 Parking Cartoon 5133: Pilot to another in an airport parking lot, "Have you ever noticed how none of the air controllers cars are parked straight?" 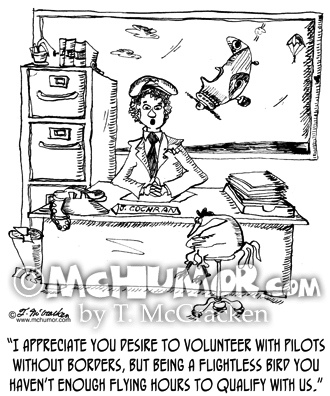 Christmas Cartoon 2302: "Santa hates the new FAA rules that require him to use VFR navigational charts." 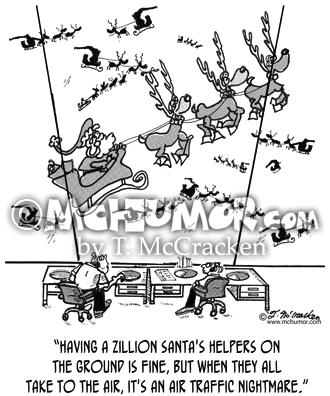 Maps fly out of Santa's sleigh as he tries to open them. 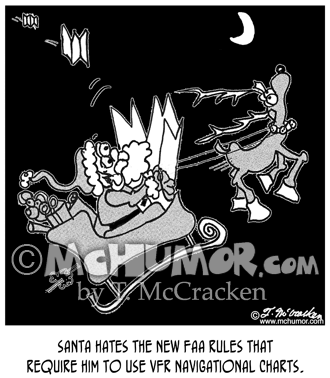 Christmas Cartoon 5782: Santa Claus in his sleigh almost runs into an airplane. 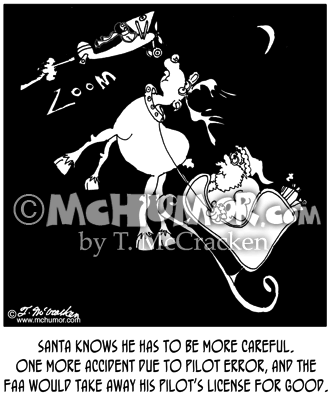 "Santa knows he has to be more careful. 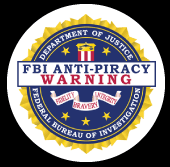 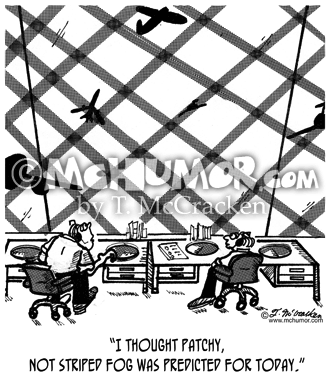 One more accident due to pilot error, and the FAA would take away his pilot's license for good." 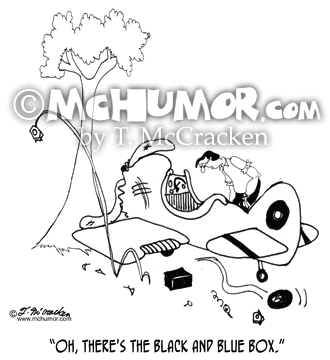 Flying Cartoon 5779: A man looking at a wrecked plane and a battered box saying, "Oh, there's the black and blue box." 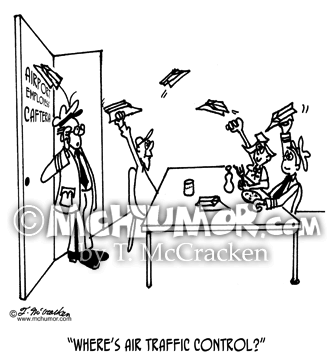 Flying Cartoon 4304: A pilot walking into an airport cafeteria where everyone is throwing paper airplanes asks, "Where's air traffic control?"